Once upon a time in a land far, far away, there lived the Big Bad Wolf. He spent his time terrorising fairy-tale characters, gobbling up grandmothers, and even had a red hooded child scooped out of his tummy with an axe. He then lived on to become the Sheriff of a small community of mythical beings in downtown New York, taking the name Bigby and solving crimes like an extra-hairy CSI with a nose for troublemakers. Sound familiar? If not, then you should head over to our review of The Wolf Among Us episode one. If you’re on the same page as us though, we’re ready to review the final episode in Telltale’s first season of its Fables-inspired game. Episode five is titled Cry Wolf and throws you straight into the thick of it, with a very action-heavy intro that was hinted at during the conclusion of In Sheep’s Clothing. It’s apparent from the start that this is the most game-y of the five episodes, with a pair of lengthy quick-time events that occur within 20 minutes of each other. They’re the usual QTEs that have been lightly peppered throughout the other episodes, but they are definitely amongst the best on offer with loads of violent flair and split-second decisions to make. The one downside to these action heavy sequences is that they go on for a bit, which isn’t a problem from a narrative and action-loving point of view; but it does start to show the repetitive nature that generally crops up with QTE overuse. When you’re told to rapidly bash the Q key for the sixth time in five minutes, you start to feel fatigued and it loses its original impact. Still, these segments are crucial to the story and finally show us what happens when you push the Big Bad Wolf to his limits. It’s also a marvel that they’ve only really lost their novelty at the final chapter. Following the big and bloody battle is probably the biggest decision in the series, one that makes the concluding scenes play out very differently. We won’t spoil it, but you definitely reach a tipping point that will define what kind of Bigby you’ve raised throughout season one. But whatever you choose to do, it still leaves a lot of questions to be answered during the concluding scenes, both those posed by the wolf sheriff you’ve raised, but also by the denizens of Fable Town. The concluding gameplay segment is a Jonathan Creek style get-together of key characters you’ve met along the way. At this point you get cross-examined, and the responses to some of your choices start to rear consequences. A lot of the time they just take the form of a stern telling-off or two, but the amount of alternative dialogue sessions Telltale must have recorded is staggering. It definitely makes us want to play through again with a new set of decisions under our belt! That being said, whilst the journey is a rollercoaster ride of sprawling choices, the destination is ultimately the same. Aside from it being more action orientated, gameplay is generally the same in Cry Wolf as it has been all along. The one omission is that there are no inventory items to gather or use in this episode, which to be perfectly honest we didn’t miss. 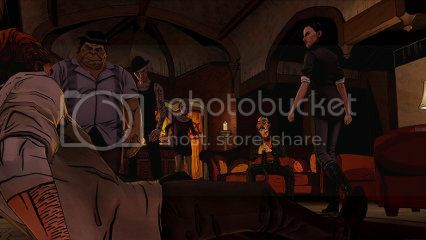 Telltale’s wave of modern storycentric games are doing a great job of washing out the bad taste of so many poorly executed point and click adventures. For every Monkey Island and Grim Fandango, there’s always been five or so knock-off contenders to water down the aging genre. With the Wolf Among Us doing away with traditional item gathering and nonsense combining, we feel the experience is a lot more slick and generally better for it. 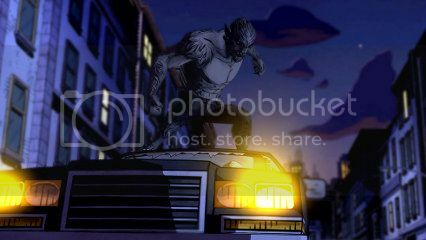 In order to keep a consistent narrative, The Wolf Among Us was always only going to have one general ending. Okay, some of the characters might have different fates and some of them might not even be alive anymore, but it all ends with Bigby striding off into the sunset. But as the game is set 20 years before the Bigby-focussed comic book series begins, you always knew that he would survive. You won’t get any weird and wonderful alternative endings a-la-Catherine here (which is a shame in some ways), but it has allowed Telltale to craft their perfect story. It also leaves things open for the inevitable second season. A neat little feature that crops up at the very end is a display of all of your decisions and how they have affected each character, giving you general cliff notes on what happened. Sure, it’s entertaining to watch your decisions play out as they happen, but showing all of the information in one place is a neat recap and lets you plan a second playthrough of alternate choices. Cry Wolf was the kind of ending we wanted. It ties everything up to a satisfying conclusion, brings up decisions you’ve made previously, and gives you a decent set of differing paths to reach the end credits. Whilst you could argue that the choices you’ve made along the way only open up new dialogue trees and don’t affect the overall story arc, the characters in The Wolf Among Us are so diverse that their reactions really make the game as special as it is. 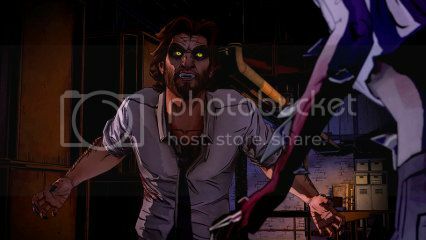 Do we want more of The Wolf Among Us? Absolutely! The first season had as thoroughly gripped at every turn and has a lot more to offer in a second storyline. We really loved the series as a whole, and pacing was generally very good; although the second episode did hang a little. By the time you’ve ripped through to the concluding number five though, any grievances you had about temporary slow-downs will be gone. Telltale remain amongst the best when it comes to weaving a fond narrative into gaming, and give us hope that there’s plenty more to live through in the Fables universe.